Former Pentagon spokeswoman Dana White says she is shocked to learn how small Israel is, how Israelis can't go into Area A. 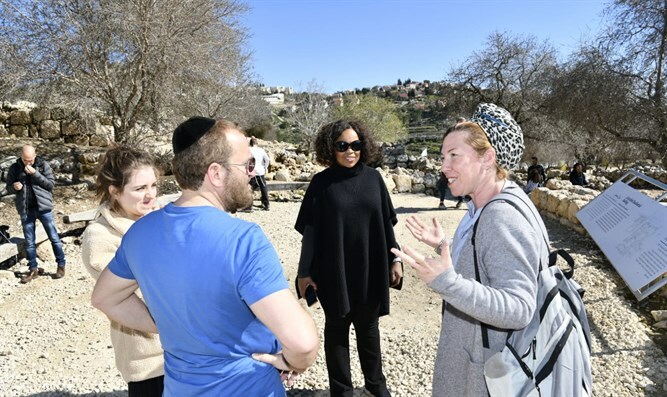 Former Pentagon spokeswoman Dana White visited the Biblical city of Shiloh in the Binyamin district of Samaria on Sunday with Rabbi Shmuley Boteach. "It's amazing how much history is there," White said, noting the city's ties to the history of Judaism and Christianity. "To see the Tabernacle, where it stood, was incredible. I don't think that, as Christians, we pay enough attention to the books of Moses, and to see that site was inspirational." "I hope to come back to Shiloh many more times, and I would encourage anyone who has any faith and wants a spiritual connection to come to Judea and Samaria, where 80% of what happened in the Bible happened there," she said. "As someone who has lived a lot of her life in politics, I was amazed by what, as Americans, we don't know about Israel, how small the country is, and how the people who literally want to kill the State of Israel are right there. There's so much that we don't know about the size, about how people live. I was shocked to see the zone A signs where Israeli citizens aren't permitted. I went to Bethlehem, the birthplace of Jesus, and my Jewish friends can't go there."